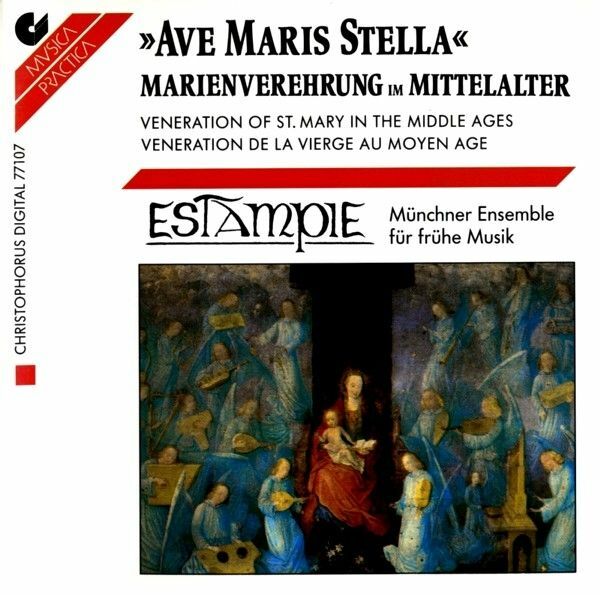 ESTAMPIE the ensemble for Early Music from Munich, was founded in 1985 bySigrid Hausen, Michael Popp and Ernst Schwindt. In the meantime the percussionist Johann Bengen belongs to the permanent cast. The ensemble strives to make the music of the Middle Ages from ca 1000-1400 an interesting experience for the today's listener. This music is characterized by strange tonal pictures, the most diverse texts depicting the medieval world of feelings and a clear formal language whose beauty is developed in various musical structures. For the musician, the essential task becomes to absorb himself creatively in compositions which often are notated merely in a rudimentary fashion. Building on fundamental knowledge regarding instrumentation, rhythmization and harmonization, each music piece is created in an individual manner only through tonal imagination, arrangement and sensitive improvisation. ESTAMPIE has played on several occasions, including during the course of the Flanders Festival, the Dollart Festival, the FAMM Concert Series and the Landshuter Hofmusiktage. In addition to concerts through Germany, Holland, Belgium and Switzerland, the ensemble has also performed on radio and television. 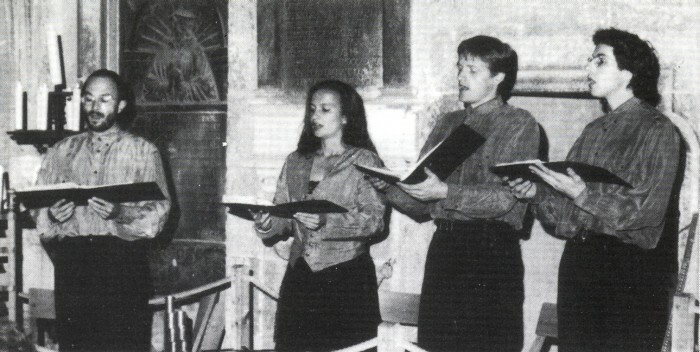 In April 1987 ESTAMPIE won the Second International Competition for Early Music in Amersfoort (Holland). Although the evangelists attached little importance to the historical Virgin Mary, the woman from Nazareth, nevertheless in the course of time an intensive and complex cult developed around her. Because of certain historical factors,this cult was able to acquire various aspects. – as virgo, the untouched, pure virgin, standing as the model picture of the middle-aged woman and mistress. There are numerous further titles and descriptions corresponding to these four aspects of the cult around the Virgin Mary, for example, ancilla dei, stella maris, generosa, splendens (in one song of a minnesinger even 72 expressions are used!). The four categories dolorosa, regina, auxiliatrix and virgo can more or less be fitted to four musical genres, that is the planctus (the lament), the song of praise, the tale of the miracle (especially in the "Cantigas de Santa Maria") and the spiritual minnesong. At the beginning of the recording we have the hymn Ave maris stella. The "sea-star" lights the way for the sailors just as it symbolically accompanies the faithful on their journey of life. In the Christian veneration of St Mary we can find many aspects of pre-Christian matriarchal cultures. For example, the "Venus-Star" already became a symbol of the sea and during the high-culture of Crete seamanship. Hildegard von Bingen is the first female composer we know by name who although was well-known for her mystical visions. Most of the important personalities of the day, emperors and popes, kept in touch with her. She was imbued with the idea of an universal divine harmony. Therefore she saw her compositions as "symphonies harmoniae caelestis" as the revelation of heavenly harmony. Oswald von Wolkenstein, lord of the castle and diplomat, is the last of the medieval minnesingers. On his journeys round Europe he also got to know polyphonic works of music in ltaly and France and then used the musical form of a four-part laude for his work of poetry Ave mater, o Maria. The Cistercian monastery Las Huelgas near Burgos was one of the main places of cultivation of polyphonic music on the Iberian peninsula in the Middle Ages. The manuscript contains the repertoire of polyphonic songs used in Las Huelgas which replaced the monophonic choral melodies on special occasions. Stabat juxta Christi crucem is an instrumental work about Mary's lament under the cross, a planctus. Ave, donna santissima is a religious song with folklore characteristics, a so-called lauda The composing of laudi has its roots in the devoutness of the people which was aroused by Francis of Assisi and which stood in conscious opposition to the official church. In this song of praise Mary's immaculate conception is sensitively compared to the rays of the sun which appear as a shining beam in a water glass without actually touching the water In the same way Jesus Christ installs himself in Mary's virgin body. Regenbogen tagewise is a piece of popular poetry which the minnesinger Regenbogen included in his repertoire. This piece found its way into the Colmar volume of song manuscripts, one of the last collections of the songs of the minnesingers from the whole of the Middle Ages. The "Tagewise"is a reconstruction of a secular morning song, which normally portrays the morning departure of the lover from his sweetheart, in a religious text. This was a common practice in the Middle Ages. The theme of this song is the prophecy and Passion of Christ, transferred however to a courtly setting with God appearing as a prince and Mary as a noble virgin. Guiraut Riquier was the last great Provençal troubadour. After the almost complete destruction of the culture in the South of France during the Albigensian crusades, the musicians were forced to look for new fields of activity in the surrounding regions. Guiraut himself found accomodation for the next decade with the art-loving King Alfonso X el Sabio in Spain. The art of the troubadours was nearing its end however and Guiraut himself expressed in one of his songs: "I came too late." In his song of the Virgin Mary called Humils, forfaitz, repres e penedens he turns to Mary, humbly and penitently because of his sins. He sees her as his last hope in his despair and calls to her: "For us, Lady royal Virgin, you became the mother of the son of God the Almighty: Ask Him for guidance for us!" Philippe de Vitry was regarded as a musical revolutionary in his time. He not only developed a musical notation which has fundamentally been preserved up to the present time, but also helped the musical forms motet, ballad, virelai and rondeau to the significance which they were to have for a long time. He also attempted to remove his musical activities from any sort of specific purpose, whether it be of a religious or of a courtly nature. Gratissima virginis species is a a double-texted motet over a two-part tenor which is performed instrumentally. Both texts deal equally with the adoration of the Virgin Mary. The two-part trope Ave gloriosa, mater salvatoris is a piece of work taken from the Friulian Codex Cividale. The record of it in twelve other sources proves the great popularity of this work. The line of melody has been kept very simple, both parts run parallel to each other in consonance. This work was composed particularly for the Virgin Mary's birthday on 8th September and includes an invocation to Mary under her various epithets. The "Cantigas de Santa Maria"are included in one of the most extensive manuscripts of music from the Middle Ages. The extremely art-loving King Alfonso (the wise one) had this magnificent anthology put together. Apart from songs of praise, there are also tales of miracles contained in this collection. The composers of the melodies were partly the King himself and also the numerous troubadours who were present at this court. "Holy Mary, star of the day show us the way to God and guide us" is the chorus of the song of praise Santa Maria, strela do dia. Da que Deus mamou tells of one of the numerous miracles which Mary was supposed to have performed: Various doctors predict that a sick woman will soon die. Full of despair she calls upon Mary who orders her to be carried in front of the Church of Santa Maria de Lugo and to continue praying fervently. After several days a miracle takes place and the woman who was so close to death is healed before the eyes of the people and the Bishop. The Codex Faenza contains the largest collection of instrumental music preserved from the Middle Ages. The 48 two-part pieces are all developed as diminuitions of songs and dances which were well-known at the time. Ave maris stella takes up the hymn from the beginning which can be heard in the lower part, while a newly composed upper part rings out. The "Llibre Vermell" is a manuscript from the monastery of Montserrat. 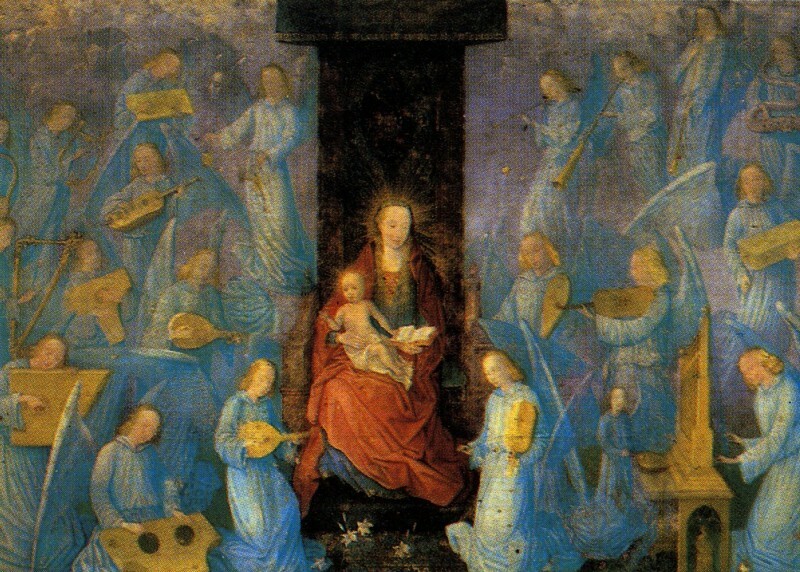 The monks of Montserrat saw in the unusual mountain, upon which their monastery is placed, an image of the Virgin Mary. The Madonna of Montserrat - called "moreneta" which means the small black one - was, according to a legend, brought by an angel on to a field and found there by shepherds. The brisk Stella splendens describes the pilgrim train of the faithful up to the Moreneta: "Bright star on the mountain, like a ray of sun full of miracles, listen to the people. They all hasten here joyfully poor and rich, young and old. Princes and magnates of royal blood, the powerful of the world, prelates and barons with noble entourage, monks, priests, soldiers peasants, scribes and advocates confess their sins full of repentance and call, on bended knees: Ave Maria".